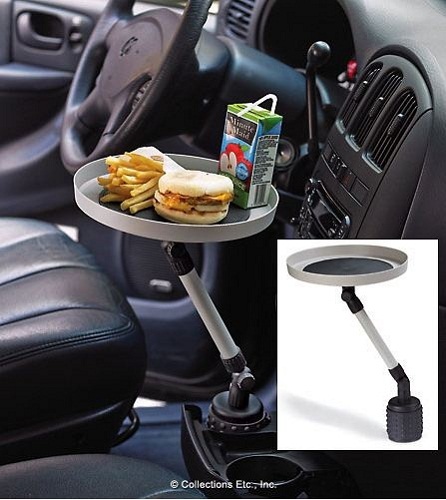 Swivel Car Tray Adds Some Class To Your Drive-Thru Meal | OhGizmo! Do you do a lot of eating in your car? If so, then you probably grow tired of digging around in the McDonald’s bag for those last few french fries. What you need is some sort of handy tray to set all of your food on before driving away. Well my friend, such a tray exists and it’s called the Swivel Car Tray. First, I would never trust this thing to hold a juice box in place, regardless of what you see in the picture. Other than that, it probably is rather handy to have around, even if it does look a bit silly. I suppose you could simply take it out of the cup holder when you aren’t planning on stuffing your face on the freeway. If this sounds like something you could use, then pick one up for just $11. Is this even legal? If you get in a car crash, the other party can proof that you were negligent because you were busy shoving food in your yap hole by pointing at that little smoking gun gadget. Is it legal to eat and drive? I read that a woman was fined for applying make up while driving so maybe eating while driving is too. I think the only time I would use it is in park. I do agree it would seem like a safety issue. Though I see it as handy, because I hate eating inside fast food places.